This proprietary filter mixture contains a high capacity weak acid ion exchange resin to reduce calcium and magnesium (hardness contributors) as well as granular activated carbon to maximize the removal of chlorine, odor and taste. The ion exchange media reduces hardness associated with alkalinity, preventing water scale formation. 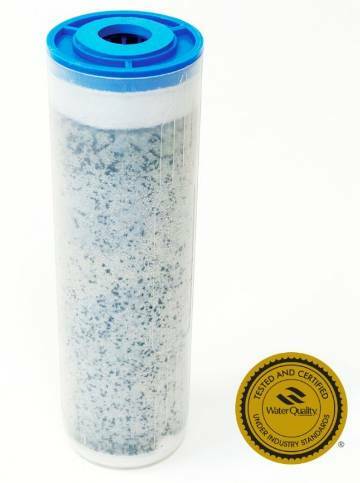 The granular activated carbon (GAC) has been specially prepared for use in drinking water filters and removes chlorine and enhances the quality and taste of the drinking water. The media is buffered to provide pH balance. Water is a good solvent and picks up impurities easily. As water moves through soil and rock, it dissolves minerals and holds them in solution. Calcium and magnesium dissolved in water are the two most common minerals that make water "hard”" The minerals responsible for hard water tend to form insoluble salts, also known as scale. Formation of scale on heating elements reduces the efficiency of small machines. A point of use cartridge removes scales by use of a weak acid ion exchange resin and in combination with GAC, removes chlorine to improve taste and odor.